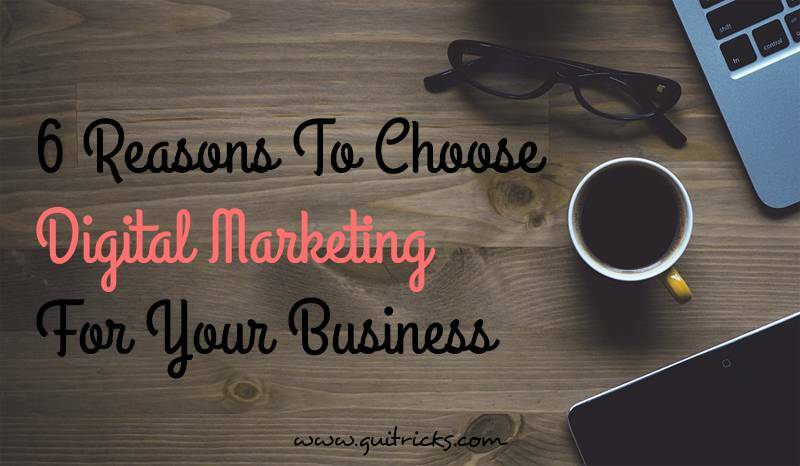 6 Reasons To Choose Digital Marketing For Your Business | GUI Tricks - In Touch With Tomorrow! 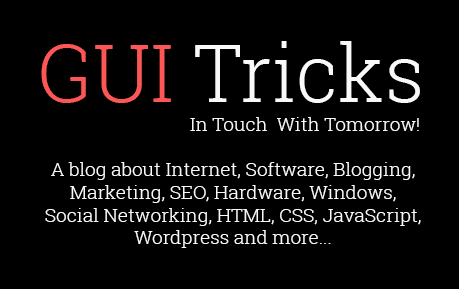 6 Reasons To Choose Digital Marketing For Your Business - GUI Tricks - In Touch With Tomorrow! Time was when a small business or start-up would be compelled to put aside a substantial outlay for marketing purposes. It would have to put in advertisements about its product or service in the print media at least, if not buy expensive airtime in electronic media. But now with the arrival of the World Wide Web into the palm of our hands, all the rules of marketing have changed. It is essential now to use the digital platform to get word about your business – be it through social media, blogs, emails or online news, lifestyle and shopping portals. If you are still not convinced, here are 6 crystal clear reasons for choosing digital marketing for your business. Imagine the entire world open up as the marketplace for your business. That’s right – whether you are selling luxury footwear, home-made bath products or tutoring online, any viewer sitting in any corner of the world can become your customer. It is this phenomenal expansion of the market place that is the top reason for choosing digital marketing. By advertising your business online, you can reach out to any individual in any part of the globe. On the other hand, for traditional marketing, this worldwide reach is logistically very, very difficult. you would need to get in touch with foreign media, whether print or electronic, abide by local publication laws, tax rules and then negotiate language barriers on the ground. On the internet, all such difficulties become non-existent or far easier to manage. 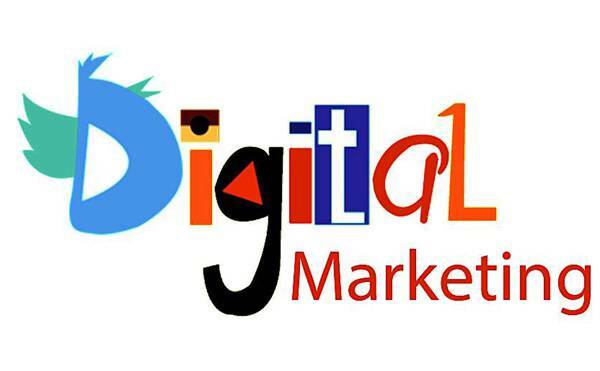 With more than half of the world’s population at 55.1% of the world’s population having access to the internet, as of June 2018, digital marketing thus is the only way to reach out to a global market in the shortest possible time. It is not that before the arrival of the internet, you did not have multinational companies. You still had people buying and selling products from and in different countries. But can you imagine how much that would cost? Renting billboards in numerous other cities, buying advertising space in foreign magazines and Yellow Pages and perhaps renting offices to get the logistics going would shoot up your marketing and overhead costs. On the other hand, digital marketing makes use of various online platforms to spread the word about your product or service while online order from your business website or shopping portal does away with the need to maintain a brick and mortar store – thus massively cutting down on costs. However, this is not to imply that digital marketing is entirely free and that mere tinkering on your laptop over the space of a Sunday afternoon will be enough to let people around the world know what you have to offer. Not at all – digital marketing is a multi-pronged approach that requires both technical know-how and creative skills. Also, it cannot be completed overnight but depending on marketing objectives may take several weeks of sustained online campaigns. But when compared to traditional marketing, digital marketing can definitely get your business wider exposure at the same cost, which is often a crucial consideration for freelancers, individual entrepreneurs, and start-ups. This point naturally follows from the above – when you can bring down costs big-time, your profits are naturally higher. But even if you consider just the revenues, digital marketing can give you better returns as compared to conventional marketing. studies show that online promotion have higher conversion rates as much as by 2.8 percent over business can continue to fall back on traditional practices. This is because people are spending is far more time on the internet, social media and on their apps rather than reading newspapers or even watching TV exclusively. Thus conversion rates tend to be higher for online promotions. At the same time though, you need to ensure that your even your digital marketing campaign is meeting its objectives. For this, you can use Campaign Tracker tools – free or premium in which case professionals can customize your online marketing approach to suit your specific business needs. One of the strongest arguments for using digital marketing to promote your business is that it helps you reach your target audience much better as compared to TV commercials and magazine advertisements just like ThanksForTheHelp targeted the students who stuck in their assignment and need the help of professional writers. With Facebook, Amazon, Google and other big names of the virtual world using progressively advanced algorithms to predict consumer behavior of millions of Internet users across the globe, it is easy for them to take your business to your target customers. Even if you are not willing to pay these companies, you can use social media groups, online article directories and major forums specifically related to your product or service to spread the word about your business. An even better-directed method of digital marketing is email marketing where you mail news about your product or service to those you know are more interested in what you have to offer. Needless to say, streamlined and more directed marketing leads to higher sales conversion for your business. No business with a vision can afford to neglect to build a brand. And all this gets much easier with digital marketing. Rather than pay enormous amounts to celebrities for endorsements, using social media, ezines and blogs make it cheaper and easier to create a unique image for your business. Adding the right images, embedding crisply edited videos and getting high ratings from existing customers could all go a long way in ramping up your business image. eventually though, once you have funds at your disposal, you could expand the marketing efforts into real-life encounters like product launches and premieres at exclusive destinations and perhaps endorsed by well-known personalities in the field. Internet of things is the latest buzzword in contemporary lifestyle. Simply put, this is a concept where all gadgets of daily use are interconnected by the internet, making them capable of exchanging data and thus identify themselves to other devices. for example, if your refrigerator is running low on eggs, an embedded sensor can detect that, transmit the message to your supermarket where with your credit card, a fresh batch will be ordered and delivered to your home. Digital marketing can both benefit from and further contribute to this emerging concept in hi-tech living. For one Internet of things is giving rise to new consumer habits and practices which digital technology is best placed to identify and adapt to – something that is beyond the pale of traditional marketing practices. At the same time, digital marketing will be befitted by IoT through higher input in customer location awareness, purchase funnel and most importantly, customized marketing. Now that you know all about the advantages of digital marketing, ensure that your business goes places at the tap of your finger. Smeeta Sharma is a blogger and manages her blog in Trustedtutors. She loves to write on the updated topics and explore the ideas. She spends a lot of time on the internet to explore the world deeply. Currently, she loves to write on ideas related to the students and help them make the right choice in their career. 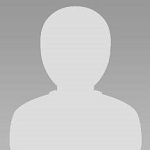 Read her latest blog of writing service ThanksForThe Help on Trustedtutors".